Today, a wonderful technology. The University of Houston presents this series about the machines that make our civilization run, and the people whose ingenuity created them. Imagine that you're outside enjoying a beautiful sunny day. You suddenly realize that your phone is out of charge. Instead of desperately searching for a wall plug, you simply plug it into your jacket. That's right. Your jacket is your charger. It may seem like science fiction... but this is not far from reality. Yes, smart suits are just around the corner. The key is to make the battery thin and flexible. Or make it part of the fabric. Basically, this thin battery is integrated with our clothing, and can bend or even stretch along with it. Now, the first step is to remove the liquid electrolyte, and replace it with a solid electrolyte2. "What is an electrolyte?" One may ask. It's the medium that allows the ions like lithium ions to pass through. Think of the electrolyte as the roads that connect one city to another. The ions are like the cars passing through the roads, carrying the charge. You can think of the two cities as the battery electrodes. Eventually, we will extract the charge from a city or electrode, when enough cars or ions have arrived. A solid electrolyte can be soft, made of polymer film3 or plastic. Surprisingly, it can also be hard, made of ceramic. Either way, it will not leak. It will be much safer. And it will allow us to make a thin-film battery. Now, if we use a ceramic electrolyte, we cannot stretch it. We can only bend it, if it's thin. If we use a polymer electrolyte, we can easily bend, and also, stretch it. Let's return to our imagined scenario. Our phone is now charged with our jacket. But that's not all. We find out that our phone is out of memory- with all those pictures and videos that we have squeezed into our phone. What about connecting our phone to our jacket for extra memory? Yes, this jacket also contains flexible and stretchable electronics. Can we go further? How about sensing our bio signals? We can measure blood glucose, heart rate, temperature, and many other biometric data with our smart suit4. Yes, the possibilities are infinite. As our technology reaches unimaginable distances, we are left with many basic questions, some philosophical in nature. How is humanity evolving with technology? Can we save more lives with smart suits? Can we prevent more diseases? On the other hand, we may ask: Are we becoming more dependent on technology? Well, this shines light on the importance of 'smart living' as we welcome the arrival of 'smart suits'. I'm Haleh Ardebili at the University of Houston, where we're interested in the way inventive minds work. 1. The flexible battery shown in Figure 1 is composed of lithium cobalt oxide cathode, and graphite anode. The polymer electrolyte is 100,000 molecular weight polyethylene oxide. 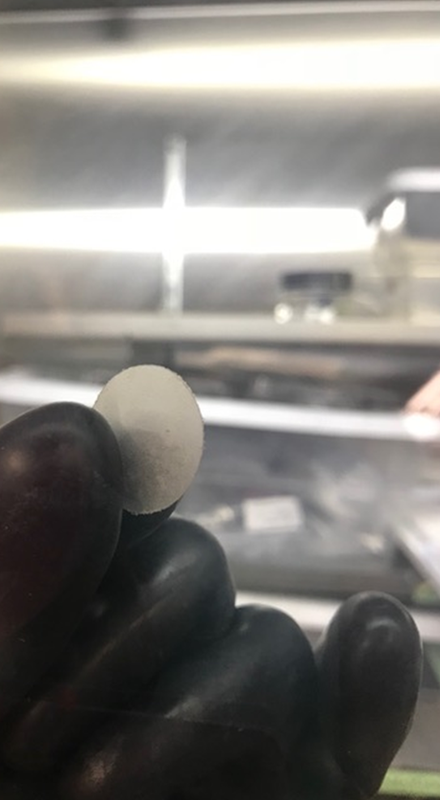 This battery was fabricated in Ardebili's research lab, by PhD Student Mejdi Kammoun (currently, a postdoctoral fellow at UH). Kammoun, Mejdi, Sean Berg, and Haleh Ardebili. "Flexible thin-film battery based on graphene-oxide embedded in solid polymer electrolyte." Nanoscale 7.41 (2015): 17516-17522. 2. There are three main types of electrolytes used for lithium ion batteries: liquid (organic, ionic), solid (ceramic, polymer), gel (crosslinked polymer with liquid). Conventional battery is generally composed of liquid organic electrolyte and a separator membrane. 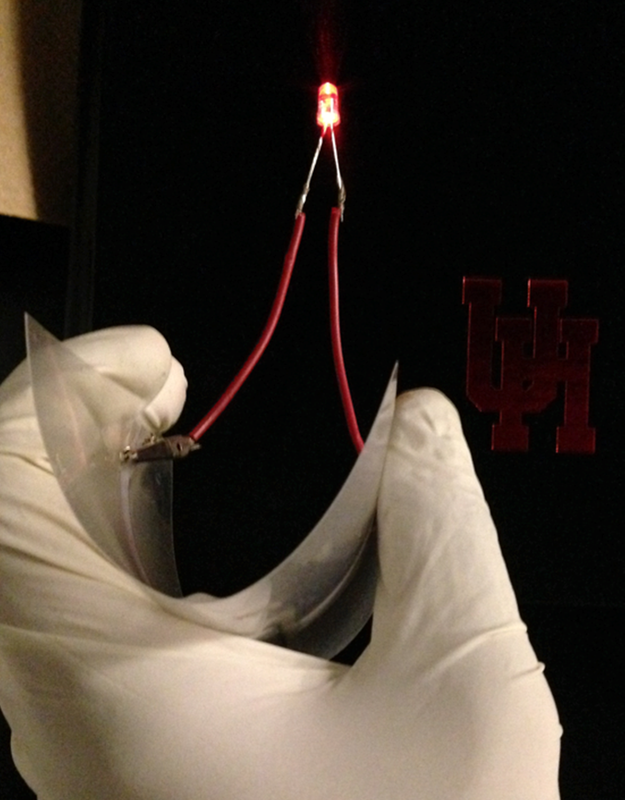 A flexible thin-film battery can be fabricated with solid polymer electrolyte which acts as both electrolyte and separator. Solid polymer electrolyte has many advantges compared to liquid organic electrolyte including higher stability, safety and thin film manufacturability. 3. The polymer electrolyte film shown in Figure 2 is made by Mengying Yuan (PhD student) in Ardebili's lab at UH. 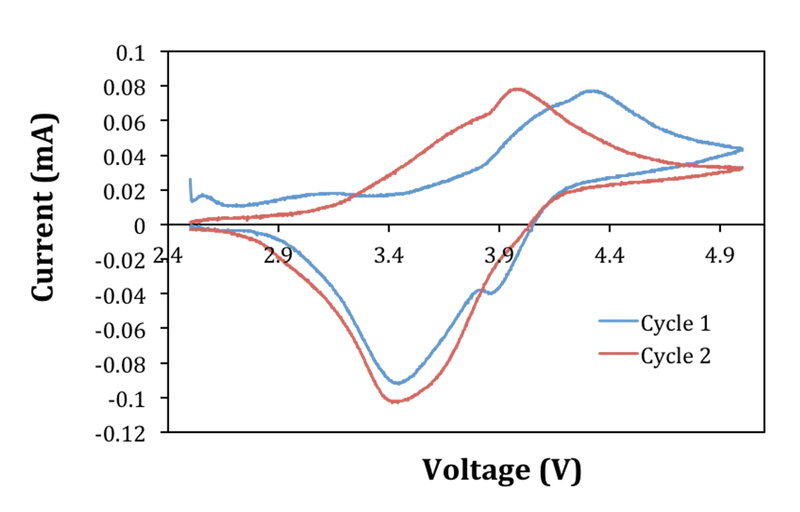 Below is a graph of current (mA) versus voltage (V) of charge/discharge cycle (cyclic voltammetry) of a coin cell battery made with polymer electrolyte. The battery was assembled and tested by Kimberly Bourland (undergraduate student in the REU program at UH, Summer 2017) and Mengying Yuan. Research Experiences for Undergraduates (REU) Program at University of Houston is funded by the National Science Foundation (NSF) (2017-2019).